One of the measures of the maturity of the sociology of religion as a subdiscipline is how well it deals with specificity in its theoretical and methodological approaches. It was 60 years ago that Will Herberg wrote Protestant, Catholic, Jew, as if the distinctions between these three religious families were definitive. We subsequently learned that ethnicity matters greatly in Catholicism (today, Hispanic immigration has buttressed an otherwise sagging Anglo Catholic population. ), that there were great differences between Orthodox and Reformed Jews, and that there were vast differences in Protestant churches. The 1960s showed us how survey research could illuminate denominational differences, which became very important during the “are conservative churches growing” phase of the 1970s. There were congregational studies and denominational research organizations that sought to explore religion in a local context using data based on attendance, membership, finances, and baptisms/conversions. All of these methods persist today, as the recent spate of articles on the Pew Religious Landscape data illustrates. There are those who want to write off certain segments of protestantism (e.g., Mainlines) or to talk about who believes the “right things” in survey responses (e.g., Real Christians). But these rough measures still feel like Herberg’s basic analysis — we assume some demographic or denominational differences and then presume meaning from those. In research design class we call this an ecological error (assuming individual behavior from collective data). What we need to do is to get closer to the ground where people actually practice their faith. This has resulted in a range of more qualitative studies (see Christian Smith et. al., David Kinnaman, Nancy Ammerman). Research like this must exchange depth for breadth. It’s simply too time consuming and labor intensive to collect Pew-style data from actual congregants. It is also necessary to maintain a strong sociological imagination when studying religion. Rather than looking at individual deficit models (e.g., “they want an non-demanding faith” or “they have authoritarian personalities”), we have to look at the cultural, structural, and organizational dynamics within which faith is practiced (or not). That’s why I was excited to finally receive this book by Josh Packard and Ashleigh Hope. It is a sociological report on The Dones: people who have been active in church life but have removed themselves from the institutional church. I first became aware of this phenomenon two years ago thanks to some blog posts by Michelle Van Loon reporting on church decline among those over 40. I returned to the topic the beginning of this year when I became aware of some preliminary data from Josh. Using a combination of sampling methods, Josh and Ashley were able to collect detailed qualitative data on over 100 individuals. He told me in an e-mail that sometimes all he had to do was say “hello” and the stories would pour out. The Dones shared a number of characteristics. They had all been heavily involved in church life, some in official staff positions. They loved the church enough to be committed to seeing it become all it had the potential of being. But the costs of keeping up that energy against institutional structures eventually become too high. There are several shared characteristics that cut across their stories. High on the list is a desire for community. The Dones (which they also call the Dechurched) wanted their churches to be places where people connected in meaningful ways. This was more than just small group programs with defined curriculum but was the place where people actually connected. That community was important is evidenced by the ways they tried to reconstruct community in non-church settings after they were Done. Related to this is a commitment to authenticity. They wanted to be themselves and make their questions and differences the raw material of their community rather than feeling that they had to demonstrate allegiance to the party line to avoid implicit or explicit judgments being made about them. A third key is that the Dones had a bias toward action both inside and outside the church. They want faith to matter, not just in doctrinal adherence but in making a difference in people’s lives. But their desire for action and mission were often blocked by congregational priorities. In their view, the church was interested in program when it aided the growth and support of the church. Respondents were discouraged from actions with poor children because their gospel presentation wasn’t clear. In addition, this bias toward action was often met with bureaucratic obstacles as programs needed approval from committees and boards or were only done by people already responsible (with no guidance on how to get involved). Those who left church were not likely to do so because of theological differences but because they weren’t allowed a safe place to discuss differences. This is an important distinction. It’s not that they didn’t believe Christian doctrine but wanted to explore its ramifications rather than being preached at. This circles back to issues of authentic community. When this is missing, when people can’t find expression for their missional passions, when church leadership engages in oversimplification or hypocrisy, the costs of remaining become far too great. In reading the book, I was struck with the notion that the denial of authenticity may have exponential cost structures — each infraction magnifies the ones that have gone before. Every squelching of community creates a deeper longing for that one community that meant so much. I want to underscore that the respondents in Church Refugees bear absolutely no resemblance to the characterizations so easily made by bloggers (not me) about people who want an easy faith and simply drift away because postmodernity is easier. These folks struggled. They had a vision of what the church could and should be and worked hard to make that happen. In the final instance, they simply determined that the escalating costs were too great to bear. It’s important also to recognize that once they left the institutional church, they found new ways of being in authentic community, of allowing conversations around important theological topics, of sharing life together, and of impacting the world around them. In that sense, they are remarkably entrepreneurial. If only they could have found an organizational openness to their creativity they might not only still be in church but would be bringing new vitality to the congregation through their efforts. As I finished the book, I found myself pondering a key question: Why am I not a refugee? I’ve been looking for authentic community, honest dialogue, and meaningful mission my entire adult life. I think there are several reasons. First, I’ve been fortunate to be close enough to “the powers that be” in my congregations to feel some openness to new ideas. Second, and more important, I’m a stubborn idealist who thinks that someone will certainly value my sociological insights if I stay persistent. Third, I work in an environment that allows dialogue around issues of faith and life so church isn’t my only venue for such conversations. But I understand those who have found the costs too great. 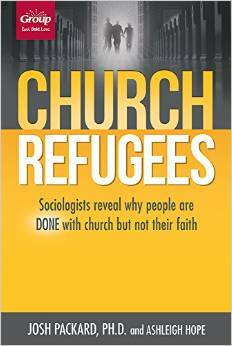 One of my takeaways from the book is to ponder how many “near Refugees” exist in local congregations. How many people in the congregation are “one more thing” from making the decision to disinvest? For all of the bloggers’ suppositions about “casual Christians”, the resources for strengthening the local congregation, and therefore the impact of religion on society, may be right under our noses. Research like Josh and Ashleigh have done is the next frontier of understanding the sociology of religion. As we get a better handle on the beliefs and behaviors of real people in real conversations, we’ll have a more robust sense of how faith works in this postmodern, complex, society. It’s quite likely that such research, rather than simply giving interpretations to shifting demographic patterns, will allow us to grasp the resilience of God’s work in a changing society. As usual, John, your thoughts make me think. Thank you. One concern: I’ve grown wary of the term “authentic” and it does make me wonder if the cultural assumptions around authenticity serve the “dones” in an unhelpful way. There is also a not so implicit judgment they’re making of the churches full of members fitting the conventional stereotype. I work in a denomination that struggles with this issue and I’ve pastored churches in which the local powers that be did tend to dominate. But partly they act this way because this is how they learned to “do church.” It pushes me back toward people of my own ilk (ordained clergy) as the responsible ones. We’ve not done a good job catechizing our folk and then sustaining them with the good teaching and practices of a pastor/shepherd. Good point, Steve. As you know, there’s only so much I can unpack in one blog post. One of the things I liked about the book is that it maintained a sociological perspective — so the problem of the “authenticity gap” becomes a structural one in the institution and not in the mind of the church member. The question I would ask: what would it look like if authentic community (I used that on purpose to distinguish it from Peck’s pseudocommunity) were central to every worship service. That we become aware that it is THIS collection of particular people, with all of their questions, problems, and doubts who come together in Worship of the Creator in whose Image they are made. That would shift the task from catechizing to shepherding in some profound ways. It has implications for even the physical space (I tried to explore some of that with my dinner theater idea here: https://johnwhawthorne.com/2014/06/25/you-deserve-a-break-today/).